To view an interactive map of the Camp Fire, CLICK HERE. UPDATE 11:07 a.m. Monday, Dec. 17, 2018 - The Paradise Post Office has officially reopened since the Camp Fire. The office is located at 6469 Clark Road in Paradise. The hours will be 10 a.m. - 4 p.m. Monday through Saturday. UPDATE 10:20 a.m. Friday, Dec. 14, 2018 - A community meeting will be held in Redding on Saturday morning from 10-11:30 a.m. for those displaced and residing in Shasta County. There will also be a debris-removal clean up moving Monday, Dec. 17, from 6:30-8:30 p.m. at the Calvary Chapel in Chico. Evacuees can turn in their Right-of-Entry Forms at the meeting. UPDATE 9:45 a.m. Thursday, Dec. 13, 2018 - The Butte County Sheriff's Office released the identity of another victim in the Camp Fire. The number of unaccounted for individuals remains at three. The number of accounted for individuals is at 3,266. Of the total 86 fatalities, 30 have been tentatively identified and 53 have been positively identified. UPDATE 4:06 p.m. Wednesday, Dec. 12, 2018 - A public community meeting will be held by Cal OES and FEMA on Saturday, Dec. 15, from 10 - 11:30 a.m.
Those interested can attend the meeting at Enterprise High School located at 3411 Church Creek Road in Redding. The meeting will take place from 10-11:30 a.m. and then there will be a time slot for survivor registration and individual questions from 11:30 a.m. - 3 p.m.
UPDATE 12:27 p.m. Wednesday, Dec. 12, 2018 - Chico City Council is holding a meeting at 6 p.m. on Wednesday in the council chambers to discuss the possibility of FEMA moving 250 temporary housing units to an area in Chico, as well as creating a debris-sorting site in the town. All those who want to express their thoughts on the matter are encouraged to attend. There is also a press conference being held at 12 p.m. on Wednesday to discuss families of Paradise suing PG&E for wrongful death. We have a reporter at the conference and will provide an update shortly. UPDATE 4:51 p.m. Tuesday, Dec. 11, 2018 - The Butte County Sheriff's Office has announced that the death toll for the Camp Fire has increased to 86. No additional remains were found in areas affected by the fire today, but the Sheriff's Office announced that Larry Smith, 80, of Paradise received burns while attempting to put out a fire that engulfed his car on Nov. 8. He was flown to the U.C. Davis Burn Center when he died of his injuries on Nov. 25. Of the 86 fatalities, 31 have been tentatively identified and 52 have been positively identified, with two additional names released today. The number of unaccounted for individuals remains at 3. The number of accounted for individuals currently stands at 3,266. UPDATE 8:14 p.m. Monday, Dec. 10, 2018- The number of unaccounted individuals stands at 3. Three aditional individuals were positively identified today and Next of Kin has been notified. UPDATE 10:51 a.m. Monday, Dec. 10, 2018 - A community meeting will be held in Oroville on Thursday, Dec. 13, to discuss and answer questions related to the Debris Removal Program. The meeting will be held from 6:30 - 8:30 p.m. at the State Theatre Arts Guild on located at 1489 Myers St, Oroville. Attendees can turn in Right-of-Entry forms at the meetings and also ask questions about the process. The meeting will be streamed live on the Butte County Facebook Page. UPDATE 4:28 p.m. Thursday, Dec. 6, 2018 - The Butte County Sheriff's Office announced today that the number of unaccounted individuals stands at 6. The number for accounted for individuals stands at 3,277. No new human remains were found today, leaving the death toll at 85. Of the 85 fatalities, 35 have been tentatively identified and 47 have been positively identified. UPDATE 6:18 p.m. Monday, Dec. 3, 2018 - The Butte County Sheriff's Office says the death toll number changed from 88 to 85. Sheriff Honea says the number for unaccounted for is 11. UPDATE 12:49 p.m. Monday, Dec. 3, 2018 - The Butte County Sheriff's Office is holding a news briefing on Monday, Dec. 3. The meeting will be held at 6 p.m. at the Butte County Human Resources Training Room located at 3A County Center Drive, Oroville. The conference will be broadcasted live on the Butte County Sheriff's Office's Facebook page. UPDATE 10:09 a.m. Monday, Dec. 3, 2018 - There will be a Camp Fire Community Meeting on Tuesday, Dec. 4 from 6:30 - 8:30 p.m. The meeting will be held at the Southside Community Center located at 2959 Lower Wyandotte Road, Oroville. It will be streamed live on the Cal OES Facebook Page. UPDATE 10:15 p.m. Saturday, Dec. 1, 2018 - There are currently 25 individuals who remain unaccounted for due to the Camp Fire. Of the 88 fatalities, 42 have been tentatively identified, and 41 have been positively identified. UPDATE 4:33 p.m. Thursday, Nov. 29, 2018 - The Community Meeting planned for Thursday, Nov. 29, at Pleasant Valley High School's Performing Arts Center is canceled due to flash flooding and heavy rain conditions. The meeting will be rescheduled for a later date. UPDATE 12 p.m. Thursday, Nov. 29. 2018 - At Wednesday's news briefing, Butte County Sheriff Kory Honea said that the death toll remains at 88, and search and rescue efforts for human remains due to the Camp Fire are complete. Additionally, he announced that the Sheriff's Office has tentative plans to lift evacuation orders in areas of Paradise and Concow next week. UPDATE 11:55 a.m. Wednesday, Nov. 28, 2018 - Cal Fire and the Butte County Sheriff's Office is having a news briefing on Wednesday, Nov. 28 at 6 p.m. to address the latest developments of the Camp Fire. The briefing will be held at Silver Dollar Fairgrounds in Chico. A Butte County Recovery Community Meeting will be held on Thursday, Nov. 29, from 7-9 p.m. The meeting will be held at Pleasant Valley High School's Performing Arts Center to provide an update on search and recovery efforts as well as discuss available resources. The Butte County Sheriff's Office says no human remains were located today bringing the total to date at 88. Of the 88, 54 have been tentatively identified. 28 people have been positively identified. The Sheriff's Office says the number of unaccounted for people stands at 158. The Butte County Sheriff's Office has released the identities of several more people who were killed in the Camp Fire. The Sheriff's Office says, of the 88 fatalities, 54 have been tentatively identified. UPDATE 6:40 p.m. Monday, Nov. 26, 2018 - Butte County Sherrif's Department says no additional remains were found today, but the wildfire's death toll rose to 88 after investigators determined human remains that had been assigned to two people actually belong to three. UPDATE 7:56 a.m. Monday, Nov.26, 2018 - The Camp Fire is fully extinguished. CAL FIRE is now focusing on cataloging structures in the area affected by the fire, they say that by the end of the week that process should be complete. Crews are now working on clearing trees, debris, and hazards. They are trying to make burned areas safe for residents to return to as soon as possible. CAL FIRE stated that unless they experience a serious delay, it is possible that areas affected by the Camp Fire will be repopulated in two to three weeks. Officials continue to search for missing people, using techniques to be as thorough as possible. UPDATE 9:35 a.m. Sunday, Nov. 25, 2018 - The Camp Fire is 100 percent contained. The total land within the containment lines is 153,336 acres. Three sets of human remains were discovered Saturday. Two were found in structures in Paradise, and one set of remains was located in a structure in Magalia. There have been 85 confirmed fatalities. Even though the last county was 84, the Butte County Sheriff's Office has revised those figures. Officials said two cases were previously pulled in error, and the number of 85 is the accurate number. 249 people still remain unaccounted for due to the Camp Fire. More than 1000 still remain on the firefighting crew. UPDATE 6:50 p.m. Saturday, Nov. 24, 2018 - The Camp Fire is now 98 percent contained. Approximately 1,200 firefighting personnel are still assigned to the CAL FIRE team. The fireline that remains uncontained is located in steep and rugged terrain where it is unsafe for firefighters to access due to the heavy rains. There is indirect control line in that area and firefighters are monitoring the situation. Once safe to do so, crews will assess this area and determine if a direct line is necessary. Fire suppression repair personnel continue to conduct rehabilitation where possible. Search and Rescue Crews, US&R Teams, and engine companies continue with search efforts this weekend. UPDATE 8:50 a.m. Thursday, Nov. 23, 2018 - The Camp Fire remained the same overnight at 153,336 acres and 95 percent containment. There are now no structures currently threatened. UPDATE 7:01 p.m. Thursday, Nov. 22, 2018 - The Camp Fire remains at 153,336 acres and is 95 percent contained. The death toll is at 84. UPDATE 9:27 a.m. Thursday, Nov. 22, 2018 - The Butte County Sheriff's Office has released the identity of six victims of the Camp Fire. UPDATE 7:02 a.m. Thursday, Nov. 22, 2018 - The Camp Fire has remained at 153,336 acres, and containment has increased to 90 percent. Cal Fire says that they expect full containment by the end of the month. UPDATE 6:52 a.m. Wednesday, Nov. 21, 2018 - The Camp Fire grew overnight to 153,336 acres and is 80 percent contained. UPDATE 6:48 p.m. Tuesday, Nov. 20, 2018 - Cal Fire says the Camp Fire is now 152,250 acres and is 75 percent contained. The death toll increased by two, bringing the total number of deaths to 81. Cal Fire says containment lines continue to hold. Search and Rescue teams continue to help the Butte County Sheriff's Office for missing victims. UPDATE 7:15 a.m. Tuesday, Nov. 20, 2018 - The Camp Fire grew overnight and now stands at 151,373 acres with 70 percent containment. Firefighters say that they are continuing to strengthen and improve containment lines while also holding direct fire lines. They are also working to help the areas already burned by the fire prepare for the forecasted rain, which is causing concerns of mudslides. New evacuation orders have also been lifted. UPDATE 7:14 p.m. Monday, Nov. 19, 2018 - The Camp Fire is now 151,272 acres in size and 70 percent contained. According to Butte County Sheriff, two human remains were located today, bringing the total number of fatalities to date to 79. One human remain was located in a structure in Paradise. Another was located outside in Magalia. UPDATE 7:07 a.m. Monday, Nov. 19, 2018 - The Camp Fire is now 151,000 acres in size and 66 percent contained. CAL FIRE says they were able to hold their established containment lines overnight. The fire has destroyed 11,713 and 14,500 structures remain threatened. UPDATE Sunday, Nov. 18, 2018 - The Camp Fire is 150,000 acres in size and is 65 percent contained. There have been 77 civilian fatalities. CAL FIRE is now reporting that 418 businesses were destroyed and 81 damaged. 10,364 homes were destroyed and 338 damaged. There are still 14,500 homes threatened by the Camp Fire. UPDATE 6:20 p.m. Saturday, Nov. 17, 2018 - The Camp Fire is 149,000 acres in size and is 50 percent contained. 50 fire trucks will be assembling at Berry Creek Saturday night to protect structures in case the winds push the fire toward homes. Preparation for structure protection has taken place in Berry Creek, but currently lines are holding. The fire is active up at Grizzly Creek and in the drainage. Lines are holding around Big Bend and preparation is taking place in case structure protection is needed. The Grizzly Creek area is very steep in inaccessible, according to CAL FIRE. Other work has been done around Helltown and Nimshew, and CAL FIRE says those lines are holding currently. UPDATE 9:08 a.m. Saturday, Nov. 17, 2018 - The Camp Fire is 148,000 acres in size and is 55 percent contained. Full containment is expected on Nov. 30, 2018. CAL FIRE officials said Friday was a great day and night for the firefighters. "It looks good," said CAL FIRE Public Information Officer Erica Bain, "until 6:00 p.m. tonight, when the winds should pick up." Bain said a lot of work has been done reinforing fire lines where the Camp Fire is currently uncontained. The community/area of Big Bend is the most critical area right now, but firefighters are working intensely on containing the fire in the Highway 70/Feather River Canyon corridor. Once the wind picks up a bit, Bain said, the visibility will improve, and then it may be possibily to resume air drops on the fire. There are no air drops scheduled until visibility clears. There are currently 5,632 personnel working on the firefighting efforts. To view the Cal Fire Incident Page, CLICK HERE. UPDATE 6:30 p.m. Friday, Nov. 16, 2018 - The Camp Fire is 146,000 acres in size and is now 50 percent contained. Officials announced that the Camp Fire has the largest deployment of Search & Rescue personnel ever amassed in the state of California. Though 329 people have been accounted for (an increase of 101 since Thursday), there are now 1011 people on the missing person list. Butte County Sheriff/Coroner Kory Honea says Thursday night there have been 71 fatalities so far due to the Camp Fire. Seven more sets of remains were discovered Friday in Paradise, and one more in Magalia. The remains of all eight were discovered inside structures. The names of two more of the deceased were announced by the Sheriff/Coroner. Paula Dodge (age 70) and Randall Dodge (age 67). They were both Paradise residents. 12,263 structures have been destroyed due to the Camp Fire. 368 structures were damaged. This includes 9,700 homes and 336 businesses that were destroyed. UPDATE 7:06 a.m. Friday, Nov. 16, 2018 - The Camp Fire has now reached 142,000 acres, and containment has increased to 45%. UPDATE 6:05 p.m. Thursday, Nov. 15, 2018 - Cal Fire says the Camp Fire is 141,000 acres and is 40% contained. A total of 9,818 homes have been destroyed. A total of 11,862 structures have been destroyed. Butte County Sheriff Kory Honea says seven additional bodies were found. 3 in Magalia, 3 from Paradise and 1 from Concow. This brings the death toll to 63. UPDATE 3:48 p.m. Thursday, Nov. 15, 2018 - Cal Fire is holding a news briefing at 6 p.m. on Thursday, Nov. 15, at Silver Dollar Fairgrounds located at 2357 Fair Street, Chico. There will also be a Paradise Town Hall Meeting on Thursday, Nov. 15 at 7 p.m. in Laxson Auditorium on Chico State's Campus located at 400 Salem Street, Chico. UPDATE 7:05 a.m. Thursday, Nov. 15, 2018 - The Camp Fire has reached 140,000 acres and is now at 40 percent containment. UPDATE 6:33 p.m. Wednesday, Nov. 14, 2018 - The Camp Fire is now at 138,000 acres and is 35 percent contained. There have been 8,650 homes destroyed by the fire. Six additional bodies were found in Paradise on Wednesday, bringing the death toll to 56. There are still 130 people who remain unaccounted for. UPDATE 7:04 a.m. Wednesday, Nov. 14, 2018 - The Camp Fire is now at 135,000 acres and is 35 percent contained. Cal Fire has a better understanding of the extent of the damage from the fire. There are now 8,814 structures that are considered destroyed from the fire. UPDATE 6:20 p.m. Tuesday, Nov. 13, 2018 - The Camp Fire has burned 130,000 acres and is 35 percent contained. There have been 8,817 structures destroyed in the fire. The Butte County Sheriff said that six additional bodies were found in homes in Paradise due to the Camp Fire. The death toll is now at 48. There have also been six people arrested and facing charges of looting. UPDATE 12:18 p.m. Tuesday, Nov. 13, 2018 - Cal Fire will hold a news briefing at 6 p.m. at Silver Dollar Fairgrounds in Chico. We will stream this live on CBS KHSL Channel 12 and our Facebook Page. UPDATE 7:12 a.m. Tuesday, Nov.13, 2018 - The Camp Fire has grown to 125,000 acres and is still at 30 percent containment. Cal Fire says that yesterday efforts to secure the area around Helltown were successful, diminishing the threat to Chico and Forest Ranch. There were no new evacuation orders, evacuation warnings, or road closures overnight. They say that the communities of Berry Creek, Forest Ranch, and Sterling City are still areas of concern. However, they want residents to know that the fire is not close to those areas and is moving slowly. Firefighters plan to work throughout the day to protect those communities. UPDATE 6:42 p.m. Monday, Nov. 12, 2018 - The Camp Fire is 117,000 acres and 30 percent contained. The Butte County Sheriff confirmed that 13 additional bodies were found today bringing the death toll to 42. It is officially the deadliest wildfire in California's history. The three victims have been identified as Ernest Foss, 65, or Paradise, Jesus Fernandez, 48, of Concow, and Carl Wiley, 77, of Magalia. President Trump has approved an expedited major disaster declaration for California over the deadly wildfires burning in the state. UPDATE 3:39 p.m. Monday, Nov. 12, 2018 - California Highway Patrol Chico released a list of vehicles that were towed from the Paradise area. The list includes the area they were towed from as well. You can find the list, which they will continue to update, on their Facebook Page. UPDATE 11:02 a.m. Monday, Nov. 12, 2018 - There will be a Camp Fire community meeting held on Monday at the State Theater in Oroville at 7:30 p.m.
UPDATE 7:20 a.m. Monday, Nov. 12, 2018 - Cal Fire says the Camp Fire is now 113,000 acres and remains 25 percent contained. Cal Fire says 29 people were killed in the Camp Fire. Action News Now is working to confirm their identities. In total, 15,500 structures are threatened, 6,453 homes are destroyed, 36 homes are damaged, 260 businesses are destroyed, 22 businesses damaged and 389 other minor structures destroyed. Cal Fire expects full containment by November 30, 2018. In terms of crew, Cal Fire says there are 4,555 total personnel assigned to the Camp Fire. There are 571 engines, 59 water tenders, 21 helicopters, 91 hand crews, 88 dozers and a number of air tankers. UPDATE 6 a.m. Monday, Nov. 12, 2018 - Cal Fire says it is battling a new spot fire in the area of Cherokee Road off Highway 70 in the area of Vinton Gulch. Action News Now reporter Elizabeth Zelidon has been out in the area throughout the morning Monday to bring us live reports on CBS 12 and NBC 24. UPDATE 6:01 p.m. Sunday, Nov. 11, 2018 - The Camp Fire has grown to 111,000 acres and is 25 percent contained. Cal Fire has confirmed 6,435 homes destroyed and 260 businesses have been destroyed. The total number of structures destroyed is 6,713. Butte County Sheriff Kory Honea has confirmed that six more bodies have been found in Paradise as a result of the Camp Fire. The death toll is now at 29. Five bodies were found at homes and one was found in a vehicle. UPDATE 1:24 p.m. Sunday, Nov. 11, 2018 - A press conference on the Camp Fire will held by Cal Fire on Sunday, Nov. 11 at 6 p.m. at Silver Dollar Fairgrounds in Chico. UPDATE 1:11 p.m. Sunday, Nov. 11, 2018 - There will be a community meeting for the town of Paradise on Sunday, Nov. 11 at 7:30 p.m. to discuss the Camp Fire. It will take place at the Laxson Auditorium on Chico State's Campus. UPDATE 8:52 a.m. Sunday, Nov. 11, 2018 - Starting at 9 a.m., Action News Now will be switching its wall-to-wall coverage from CBS KHSL Channel 12 to NBC KNVN Channel 24 for the remainder of the day. UPDATE 7 a.m. Sunday, Nov. 11, 2018 - Cal Fire held a news conference to inform the public about developments with the Camp Fire. The Camp Fire has grown to 109,000 acres and is 25 percent contained. UPDATE 6:30 p.m. Saturday, Nov. 10, 2018 - Cal Fire held a news conference to inform the public about developments with the Camp Fire. The Camp Fire has grown to 105,000 acres and is 20 percent contained. The estimated cost of the fire so far is at $8,089,294. Cal Fire announced that there is no imminent threat to the residents in the city of Oroville. However, weather forecasts are predicting another one to two days of strong north-eastern winds which has the potential to create explosive fire behavior. Currently, 6,453 residences have been destroyed and 260 businesses have been destroyed. There are still 15,000 structures that have been threatened. Butte County Sheriff has confirmed that 14 additional bodies have been confirmed as a result of the Camp Fire. The death toll is now at 23. Action News Now will resume wall-to-wall coverage of the Camp Fire on CBS KHSL Channel 12 to provide the latest updates. UPDATE 2:44 p.m. Saturday, Nov. 10, 2018 - A Community meeting will be held to discuss the Camp Fire at 7:30 p.m. at Laxson Auditorium on Chico State's campus. UPDATE 1:43 p.m. Saturday, Nov. 10, 2018 - Butte County Sheriff Kory Honea has confirmed that Paradise High School, Paradise Police Department and Paradise Town Hall are all still standing. UPDATE 12:32 p.m. Saturday, Nov. 10, 2018 - Cal Fire will hold a press conference about the Camp Fire at 6 p.m. on Nov. 10 at Silver Dollar Fairgrounds Harvest Hall located at 2357 Fair Street, Chico. UPDATE 11:41 a.m. Saturday, Nov. 10, 2018 - Our 24/7 coverage of the Camp Fire will continue online at actionnewsnow.com. CBS Channel 12 will resume regular programming with news at 6 p.m. and 11 p.m. with updates every 30 minutes. NBC Channel 24 will resume regular programming with news at 6 p.m. and 11 p.m.
UPDATE 9:35 a.m. Saturday, Nov. 10, 2018 - Cal Fire released a statement regarding the conditions and directions of the fire. Strong northeast winds are expected to return this evening. The fire will continue to burn to the northwest impacting the communities of Magalia and Paradise Pines. The communities of Stirling City and Paradise Pines are still threatened. The fire is holding to the southwest near Chico and south at Highway 99 and Highway 149. 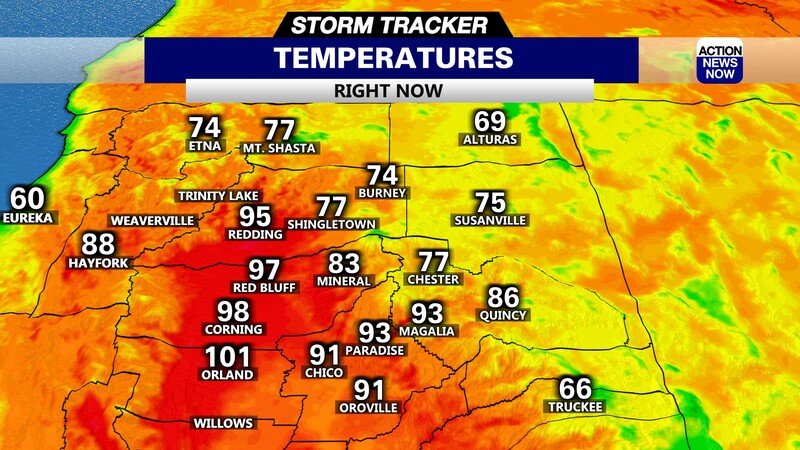 The fire will continue to burn to the southwest toward Big Bend, Berry Creek and threatening the city of Oroville. The expected strong northeast wind event has the potential to drive fire across Lake Oroville, threatening the city of Oroville. UPDATE 7 a.m. Saturday, Nov. 10, 2018 - The Camp Fire is 100,000 acres and is 20 percent contained. 6,453 residential structures are destroyed. 260 commercial structures are destroyed. There is a total of 6,713 structures destroyed. There have been nine confirmed fatalities in the Camp Fire. Cal Fire is currently having a press conference to address the fire. Watch live on our Facebook Page. UPDATE 7:25 p.m. Friday, Nov. 9, 2018 - Cal Fire released an incident update report regarding the Camp Fire. They said that strong northeast winds diminished around midafternoon and ushered in the return to a typical diurnal pattern. The fire area is still under the influence of low relative humidity and dry fuel moisture. They observed moderate to extreme fire behavior over the fire areas. It will continue to burn to the northwest impacting the communities of Magalia and Paradise Lake. The community of Stirling City is still threatened. The fire continued to burn to the northeast on both sides of Highway 70. The fire continued to burn to the southwest into the east Chico city limits and Highway 32. The fire is holding to the south at Highway 99 and Highway 149. It will continue to burn to the southwest toward Big Bend and Berry Creek. It will continue to threaten buildings in communities in Paradise, Chico, Magalia, Concow, Stirling City, Yankee Hill, Butte Creek Canyon, Butte Valley, Honey Run, Helltown, Forest Ranch and Oroville. UPDATE 6:02 p.m. Friday, Nov. 9, 2018 - The Camp Fire is 90,000 acres and is 5 percent contained. UPDATE 4:19 p.m. Friday, Nov. 9, 2018 - Butte County Sheriff has confirmed a sixth fatality as a result of the Camp Fire. The body was found in Paradise, but they are not disclosing an exact location. UPDATE 3:33 p.m. Friday, Nov. 9, 2018 - Cal Fire says that the fire is currently burning on both sides of the Feather River, south of the Jarbo Gap. A TEXT to donate has been set up by United Way to help with recovery efforts. UPDATE 2:20 p.m. Friday, Nov. 9, 2018 - The Butte County Sheriff's Office has confirmed that the Honey Run Bridge in Chico has been destroyed by the Camp Fire. UPDATE 12:53 p.m. Friday, Nov. 9, 2018 - Town councilwoman Melissa Schuster has confirmed that the Feather River Hospital in Paradise has not been destroyed, it is just damaged. There are some buildings on the campus that have burned but the structure is still standing. Paradise High School and the Town Hall are also still standing. We will update you on this when we have more information. UPDATE 11:08 a.m. Friday, Nov. 9, 2018 - The Butte County Sheriff's Office has confirmed five fatalities due to the Camp Fire. The bodies were found in vehicles on Edgewood Lane in Paradise. The preliminary investigation reveals that they suffered burn injuries as a result of the Camp Fire. UPDATE 10:29 a.m. Friday, Nov. 9, 2018 - Cal Fire released an incident report regarding the Camp Fire stating that it is still at 70,000 acres and 5 percent contained. 15,000 structures are threatened and there are an estimated structured destroyed are 2,000. Expected full containment is Nov. 30. Strong northeast winds pushed the fire to the south and southwest overnight. 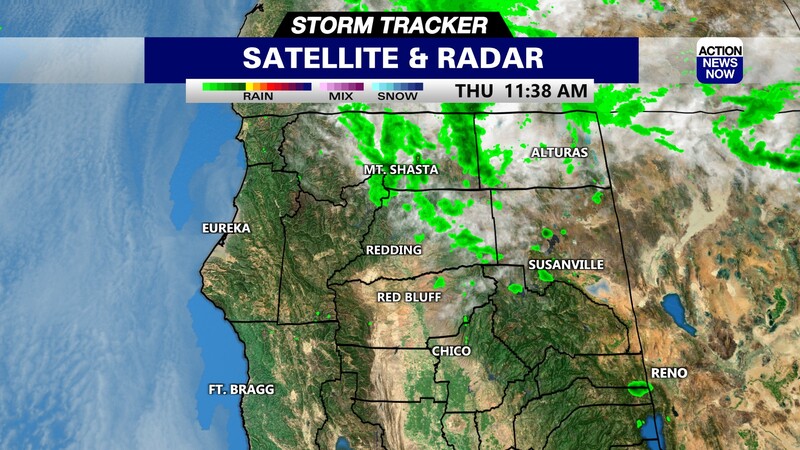 The northeast winds will continue through the morning and decrease in strength into the afternoon. The fire will continue to burn in drainages to the north and northeast. The fire continues to burn into the northwest into Magalia and toward Stirling City. The fire burned through the town of Paradise and Concow Thursday and these areas will continue to experience active burning throughout the day. Overnight, the fire burned to the southwest toward the city of Chico and Butte Creek Canyon and south toward Highway 99 and 149. The fire has crossed Highway 70 near Pulga and will continue to burn to the east and southeast toward Yankee Hill. UPDATE 10:03 a.m. Friday, Nov. 9, 2018 - Cal OES held a press conference on Nov. 9 to discuss the Camp Fire and other fire ravaging California. They said that over 52,000 people have been evacuated due to the Camp Fire. They also confirmed that there are fatalities but there is not an exact number at this time. UPDATE 9:02 a.m. Friday, Nov. 9, 2018 - Willows Unified School District is shutting down on Nov. 9 at 11:30 a.m.
UPDATE 7:30 a.m. Friday, Nov. 9, 2018 - Butte County Cal Fire said Friday morning that the devastating Camp Fire has grown to 70,000 acres and is now 5 percent contained. California Office of Emergency Services said they will be having another press conference at 9 a.m. to update on what state agencies are doing now to combat the fire. Butte County Sheriff Kory Honea also said that there is a possibility of civilian casualties, however he could not comment on the specifics. Cal Fire officials said the 5 percent containment is due to a containment wall built along Highway 32, blocking the fire from spreading to Chico. Now firefighters are working to build containment walls along the north to the Magalia area and south along the Concow area. UPDATE 5:54 a.m. Friday, Nov. 9, 2018 - Butte County courthouses will be closed Friday. Both Chico and Oroville court cases that are scheduled to be heard today are going to rescheduled, according to Presiding Butte County Superior Judge Tamara Mosbarger. UPDATE 5:48 a.m. Friday, Nov. 9, 2018 - Firefighters worked throughout the night battling the Camp Fire on multiple fronts, they are working to create a containment line near Humboldt Road and Highway 32. UPDATE 11:19 p.m. Thursday, Nov. 8, 2018 - Firefighters are now working to save homes along Stilson Canyon Road. The fire has not yet burned into the Chico city limits. UPDATE 8:54 p.m. Thursday, Nov. 8, 2018 - Los Molinos Unified School District Schools will be closed on Nov. 9 due to many teachers and staff living in parts of evacuation orders. UPDATE 8:50 p.m. Thursday, Nov. 8, 2018 - The Chico Police Department has started evacuations in the east side of Chico. UPDATE 7:13 p.m. Thursday, Nov. 8, 2018 - The Camp Fire is now 20,000 acres with no containment. UPDATE 5:43 p.m. Thursday, Nov. 8, 2018 - Cal Fire has confirmed that three firefighters have been injured in the Camp Fire. The status of their injuries is unknown at this time. We will update you with the information as it becomes available. UPDATE 5:18 p.m. Thursday, Nov. 8, 2018 - The Butte County Sheriff's Office released updated information on the Camp Fire following the news briefing at 4 p.m. today. The fire has forced around 27,000 people to evacuate and remains at 18,000 acres with no containment. There have been no confirmed fatalities, but there are investigations underway into reports of fatalities. There have also been reports that the Feather River Hospital has been destroyed according to John Lord, Associate Director of the Sierra-Sacramento Vally EMS Agency via Mike Mangas of Mercy Medical Center. “Be advised we have received confirmation from units on the ground in Butte County that Feather River Hospital has been destroyed by fire,” he said. UPDATE 4:19 p.m. Thursday, Nov. 8, 2018 - According to PG&E there are 34,000 customers are without power in Butte and Plumas counties due to the Camp Fire. For safety, PG&E has also shut off natural gas service to all 12,000 gas customers in Paradise. Additionally, Butte College's main campus in Oroville is closed Nov. 8 and 9. Classes schedule tonight at the Chico Center, Skyway Center and Cosmetology Center are canceled Nov. 8 and 9. The Glenn Center will remain open. The College's main campus is being used as a staging area for Cal Fire. UPDATE 4:01 p.m. Thursday, Nov. 8, 2018 - All schools in the Chico Unified School district will be closed today and tomorrow due to the Camp Fire. UPDATE 3:30 p.m. Thursday, Nov. 8, 2018 - There will be a news briefing held at the Butte County Sheriff's Office to discuss the Camp Fire. Butte County Sheriff Kory Honea described the fire as "very serious," and told Action News Now's Debbie Cob that when he drove through Paradise it was so dark as if it was Midnight. UPDATE 2:25 p.m. Thursday, Nov. 8, 2018 - The Camp Fire is now 18,000 acres with no containment. UPDATE 1:19 p.m. Thursday, Nov. 8, 2018 - Oroville CHP said that the fire is working its way toward Chico. They are working to close all northbound traffic on SR-99 to prevent access into Chico. UPDATE 12:13 p.m. Thursday, Nov. 8, 2018 - The Camp Fire has grown to 8,000 acres with no containment. UPDATE 11:28 a.m. Thursday, Nov. 8, 2018 - The Camp Fire is now over 7,000 acres with no containment, according to the Butte County District 1 Supervisor. Butte College's main campus is closed as a precautionary measure and will remain closed for the rest of the day. The Chico, Glenn and Skyway centers are still open. UPDATE 10:00 a.m. Thursday, Nov. 8, 2018 - The Camp Fire has grown to 5,000 acres with no containment. UPDATE 9:26 a.m. Thursday, Nov. 8, 2018 - An evacuation center is opening at the Oroville Nazarene Church located at 2238 Monte Vista Ave., Oroville. Small animal shelter set up at 2279 Del Oro Avenue, Oroville. UPDATE 9:05 a.m. Thursday, Nov. 8, 2018 - All of Paradise is under mandatory evacuations except Lower Clark Road, Lower Neil Road, and Lower Skyway Road. Oroville CHP advises everyone to please leave the area immediately and do not try and re-enter. UPDATE 8:40 a.m. Thursday, Nov. 8, 2018 - According to CHP Oroville the fire is moving towards the Feather River Hospital on Pentz Road. Oroville CHP said they are being told that all of Paradise needs to evacuate. 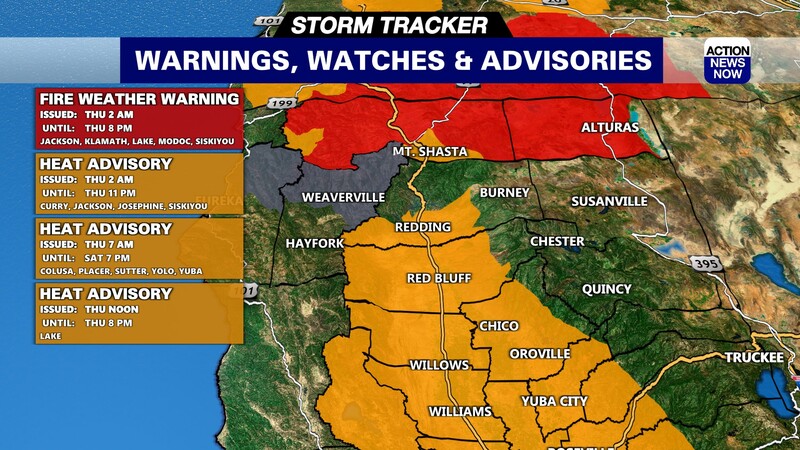 Fire zones 2,7,13 and Morgan Hill are now under mandatory evacuation. UPDATE 7:09 a.m. Thursday, Nov. 8, 2018 - The Camp Fire is now at 1,000 acres. Dozens of resources being called in from throughout the State. UPDATE 7:03 a.m. Thursday, Nov. 8, 2018 - There are now mandatory evacuations issued for areas of Paradise. Pentz road is under mandatory evacuation orders and anyone west of Pentz Road is requested to leave the area. The road closure is being expanded. SR-70 will be closed from Pentz Road to SR-70 (Greenville Wye). This is a very active fire; therefore, nobody will be allowed into the closure except for emergency personnel. BUTTE COUNTY, Calif. - Oroville California Highway Patrol is closing Highway 70 at Pentz Road to the town of Belden due to the fire. CAL FIRE Butte County says that they are working to access a fire in the area of Camp Creek Road near Highway 70 in the Feather River Canyon. They are calling it the Camp Fire. It is currently 10 acres. There is concern that the fire may spread due to windy conditions in the area. Evacuation orders have been issued for the town of Pulga by the Butte County Sheriff's Office. If assistance is needed in evacuating, call 911.